If you're a woman who wants to lead - or to lead more powerfully - there's a key tool you need. It's called Leadership Presence - and you simply can't lead without it. It gives you the visibility, credibility and gravitas to take your career to whatever heights you aspire to. It's the 'x-factor' that the most confident, happy, successful leaders have. And it can be learned. Learn to become a happy, confident and relaxed leader who is listened to and makes their mark. You can excel in your role and enjoy it too. I'm Ready To Become An Inspiring, Influential & Engaging Leader! How to manage self doubt and build your confidence, with tools that will ensure you impress and inspire colleagues, customers and your employer. How to develop the crucial skill that every leader MUST possess - your emotional intelligence. A calm and resilient leader is a strong one. Learn how to manage your emotions so you're trusted, respected - and listened to. 5 strategies for raising your profile. Being your organisation's best kept secret won't help you to have continuing career success - being seen and heard by the most influential people, will. The secret to maximising your impact in any situation - ensure you're making the impression you want, every time. How to change your mindset so you can manage difficult conversations with ease. Understand the number one skill you need to become an expert communicator, and instantly engage anyone. "A must-read if you aspire to bigger and better things!" 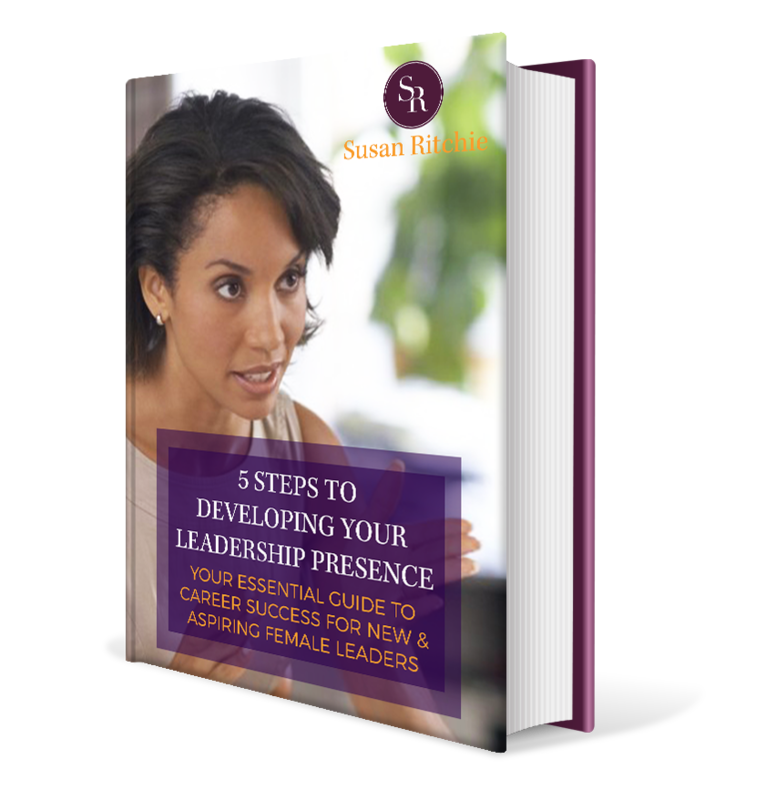 "Sue's 5 steps to developing leadership presence really helped me to focus on my behaviour, beliefs and attitude and the impact of these on the people around me. Her down to earth, common sense advice allowed me to put into practice some of the techniques that would improve my leadership presence straight away. I would recommend this e-book to anyone who aspires to bigger and greater things in their career; the techniques given can be used at any time to change the outcome of situations which means it's a not to be missed eBook to have in your collection and to revisit it regularly to remind yourself of how to 'turn up' ." "Inspirational! Susan Ritchie cuts to the chase offering a warm, accessible writing style and tips and tools to empower you to achieve success. You get a sense throughout that Susan has "been there" and has undertaken a professional journey which has involved many (sometimes painful) lessons. She is offering to share this experience with you so that you can learn from it too... Bite her hand off!" "In my role as leadership development coach I am often recommended books to read on different aspects of learning and development, I quickly lose interest if the books don't offer me something 'new'. Happy to report I thoroughly enjoyed reading yours! Rare to find a leadership text written from a female perspective, a powerful point of difference for me."